We’ve been missing our wacky Fasching Parades since leaving Germany. What today’s Aloha Week Festivals parade lacked in wackiness, it more than made up for in island flavor. old cars (I love the simple decorations on this one and have made up a full story about the driver of this truck and how he fishes for octopus and hangs out with his friends speaking pidgen and eating smoked meat with poi). Random surfers crossing the street add the perfect island touch behind this car. and there were Tutus in cars. But, my favorites had to be the Princesses representing each island, decked out in symbolic lei and chanting greetings from their homes (roll your cursor over each one to find out her island). Bringing up the rear of each equestrian group were designated pooper scoopers. The lady we were sitting next to (who happened to be the principal of Sacred Heart School, and who’s school had an excellent band and float) said that she thought that the pooper brigades were judged as well as the floats, explaining why great lengths were taken to dress them well. While Ni’ihau and Lanai scored high in my book, we all agreed that a volcano poop repository was very fun. 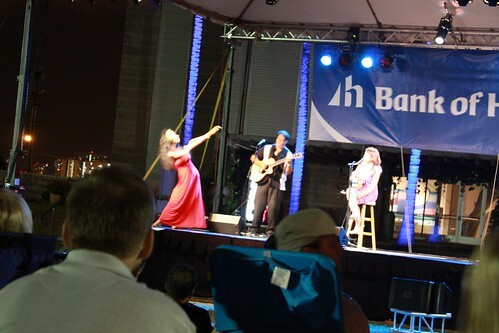 For more pictures, including hula on the street and hula on the back of floats, check out my Flickr page. This weekend is the American Sewing Expo in Novi, Michigan. One of the exhibits is “Breaking Traditions,” an annual show devoted to fundraising for good causes. This year’s theme is Home, and donations support A Place To Bark, an animal rescue operation in Tennessee. With the theme Home, how could I not participate?! As an extra, added bonus, I just found out it was selected as Exhibit Favorite, and I won a bundle of awesome prizes! An art quilt book by two artists whose work I really enjoy, transfer papers that I’ve been intrigued by but never tried, and paint that I’ve heard nothing but good things about. I’m so excited! Last night the kids went to movie night at their taekwondo studio and I had a Saturday night to myself. 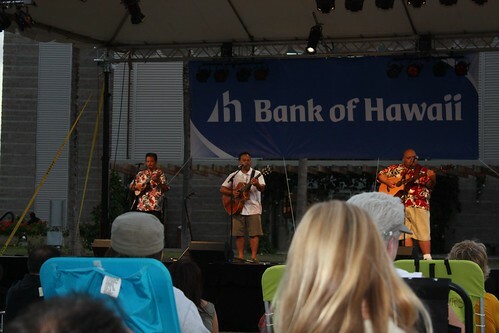 I thought maybe I’d go to Waikiki and listen to music at one of the hotels, or otherwise pretend I was a tourist. My go-to parking lot was full though, and at the other end of the strip, I found coin parking, but without a clear idea of what I was going to do or where I was going to go, I didn’t think I had enough quarters. So I went home. I felt like such a wimp. 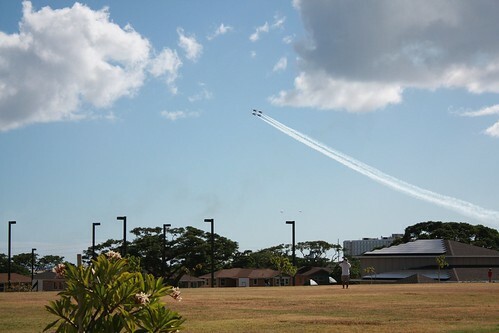 Today, Sunday, I offered that we go to Hickam Air Force Base to see the airshow, but my heart wasn’t really into hassling with parking and crowds, and besides, my son had been to the show on Friday with school and I’m not that into airplanes. So I didn’t mind when they chose instead to take up a friend’s invitation to play at his house. I said I’d pick them up at 3:00. 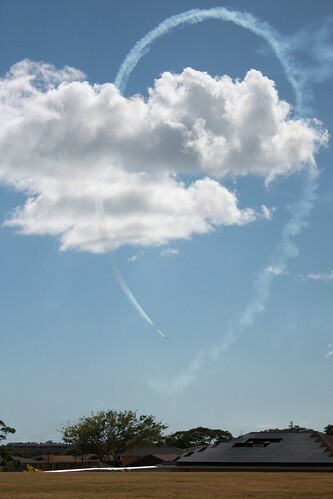 I came home and read some blogs, and found out that the Thunderbirds would be flying today at 3:00. Hmmm. The friend’s house is in the Airforce/Navy housing area near Hickam. Hmmm. Their house is next to a large park. I put my camera in my purse and left a little early. 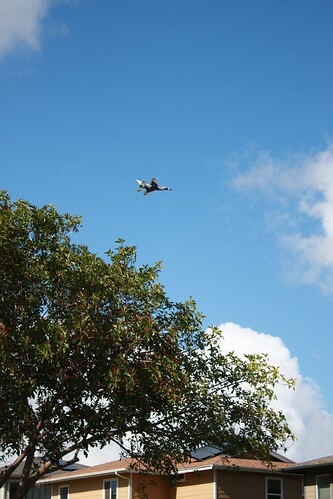 The first plane zoomed by just as I was pulling up to the house. It is impossible not to be impressed by the speed of these planes, and how unimaginably close together they fly. And the noise! 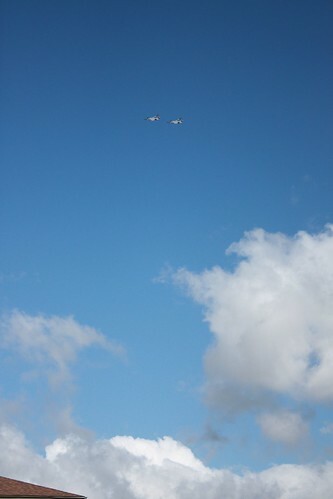 It was a bit of a game hearing the planes and then guessing where they’d show up. One flew so close that my camera actually tried to focus on it as it went by, but failed because of the jet’s speed. I think I’m OK again with taking advantage of all there is to see and do here. I’ve been a bad supporter. When I found out about the altered bra project for our local Hawai’i Chapter of the American Cancer Society, I got all excited and made a calabash bra filled with poi and covered in flowers. But then I dropped the ball on supporting the cause by finding sponsors for my “cups of life.” I posted about the bra about the same time my site was down for two days, and then my project seemed so insignificant and puny compared to all the IBOL hoopla my hubby had tapped into, so I let it sit unloved. Now I’ve got one week to gather as much support as I can for my calabashes. Look out neighbors! If any blog readers would also like to sponsor my bra and in doing so donate to the ACS Hawai’i chapter, please leave a comment and we’ll work something out. I’m keeping busy at home, but have nothing to show for it. No finished projects, no clean rooms. Even the air conditioning I had fixed in my car a few months ago has undone itself and is back in the shop. The big news is Mr. Incredible’s Iraqi Bundles of Love project — the date for mailing your bundles has passed, so now we wait for the avalanche of donations to arrive, and for my man to figure out a way to share with us the recipients’ reaction. This has been an amazing experience — bringing people together from all over and with myriad motivations. The Blurred Boundaries show is also over and one of my pieces sold. Woo hoo, “Pink House” has a new house! The next event is the SAQA auction. I’m sorry to say that I did not enter anything this year, but wow, those who did enter really went for it! There is some great stuff. The auction starts on Thursday the 10th — be there! 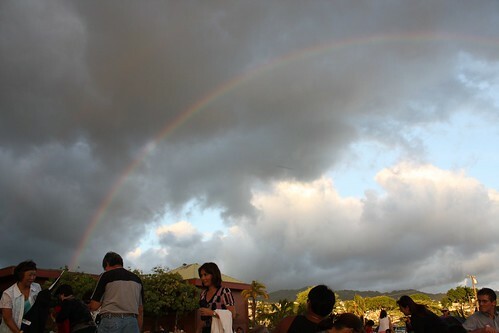 It doesn’t seem like summer is over here in Hawai’i, but there are hints if you look hard enough. Like the kids have been back in school for five weeks already! 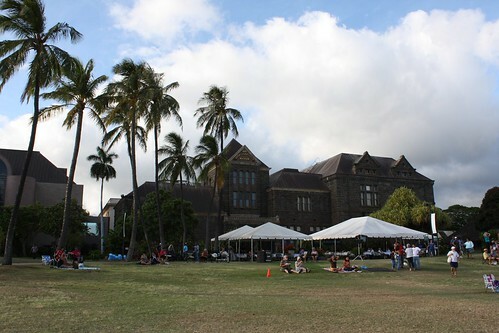 A few weeks ago was the last Moonlight Mele of the summer at Bishop Museum. We’re members, but hadn’t gone, so I dragged the kids out for an evening of culture. It’s still early in the picture, so the lawn hasn’t filled up yet with people. 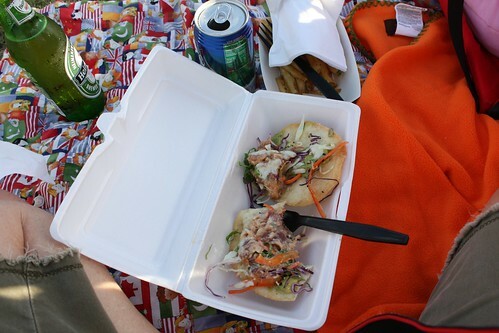 The whole casual, bring a blanket and a beach chair thing reminds me a bit of Hollywood Bowl picnics when I lived in LA. You can’t bring in your own food here though, so there’s no elaborate champagne and roast chicken dinners a la Sunset Magazine. I’d definitely do this again, and it was pretty kid friendly too. Next summer, we’re there. Speaking of kids, Saturday is my son’s 11th birthday. I keep remembering that I keep forgetting to do anything about this. Must go get his present, a piñata, and taco stuff for 12. 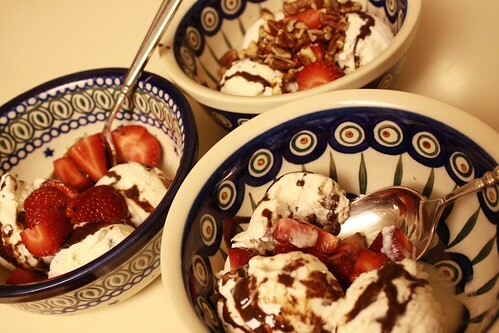 Bringing up the time zone rear, we celebrated IBOL Sundae with, wait for it……… Sundaes! 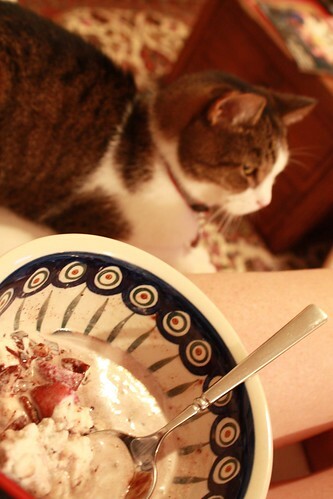 Mint chip ice cream, IBOL Super Sauce, strawberries from Maui (so worth the extra $$), and pecans on mine. Even the cat feigned some interest via mere proximity. So, with IBOL Sundae over, we have Monday to pack up any boxes we haven’t gotten to yet and then Tuesday to put those boxes in the mail. I’m looking forward to following the box count on the IBOL web site to see just how impossibly high it will get in the next 10 days or so. Then, I’ll wait not so patiently for the response from recipients. Happy IBOL Sundae! Blurred Boundaries is over. 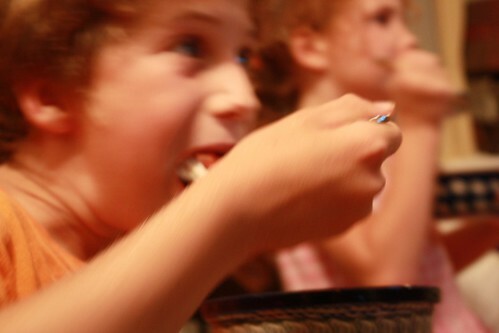 The exhibit’s curator, Lynn Krawcyzk has lots of photos up on her blog now. Be sure to click to see the show larger. It’s nice to have artwork accepted into a show, but it’s even nicer to see all the work hanging together. I am very pleased that my two pieces look completely at ease with their neighbors. Go, check it out.